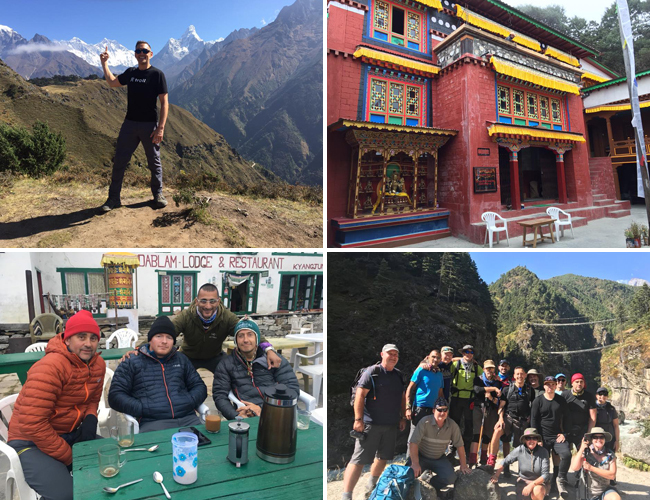 Our seven trekkers are currently on their two week adventure to Everest Base Camp. We will be keeping you up to date on the latest developments, hurdles and accomplishments as they take on the toughest challenge of their lives. For more information about why they are doing the trek and the village that we are supporting, please click here. 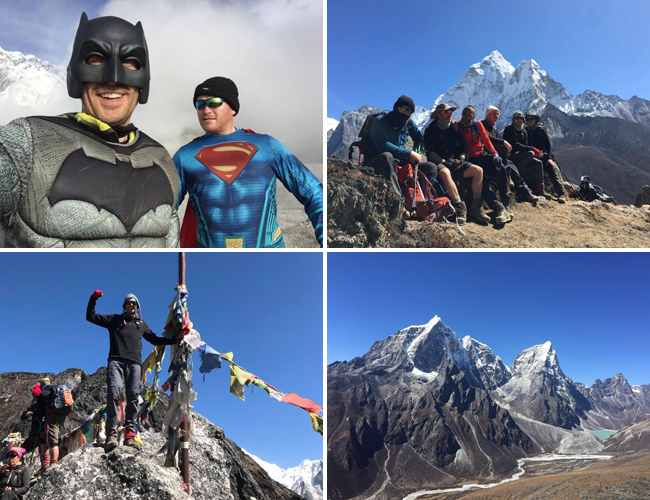 On Wednesday 12th October, Sean Newman and Clint Nykamp from Fine & Country met with the other five members of their team at Heathrow airport to get their flight to Kathmandu. The generosity of clients, friends and family resulted in the group filling up seven cases of donated items for the village. A huge thank you goes to the generosity of Qatar Airways who allowed the group to take all the cases on the flight. The group safely landed in Kathmandu, the capital of Nepal. From Kathmandu, they needed to fly to Lukla, one of the most dangerous airports in the world. Adverse weather conditions prevented the team from landing at Lukla and they were diverted to another airport to wait for the weather to improve. Spirits remained high and the team eventually made it to Lukla to begin their trek. Take a look at the latest fundraising progress and donate here. The team set off with their spirits high and adrenaline pumping. They climbed 9,000 steps to reach over 10,000 ft, where the altitude starts to have an impact. 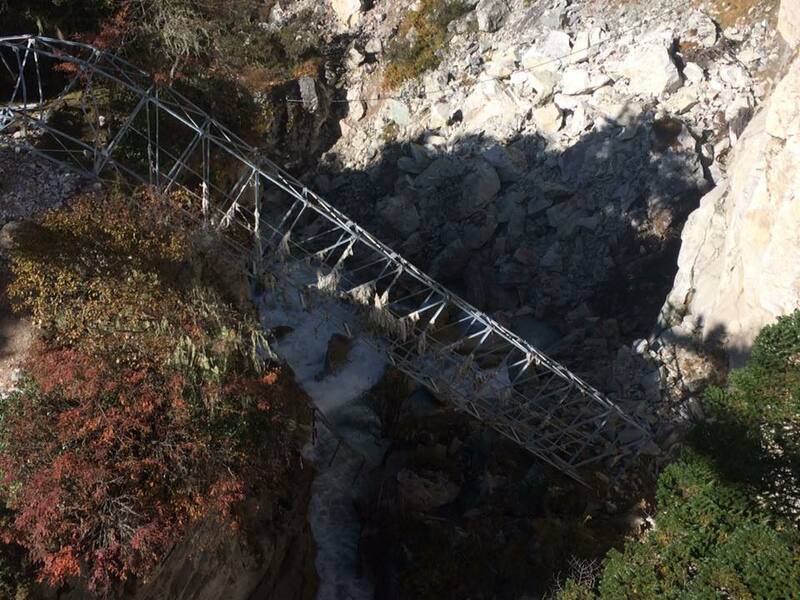 They had to cross a suspension bridge over the Dudh Kosi (‘Milk River’) which proved to be a tougher challenge than it seems with terrifying heights and strong winds hitting the trekkers from every angle. Mark found out that heights are not his forte. Find out here what happened on the suspension bridge. Mark was not the only one to reluctantly cross the bridge; the team are meeting other trekkers throughout their journey. Simon was speaking to one man called Rob who looked even more nervous than Mark. 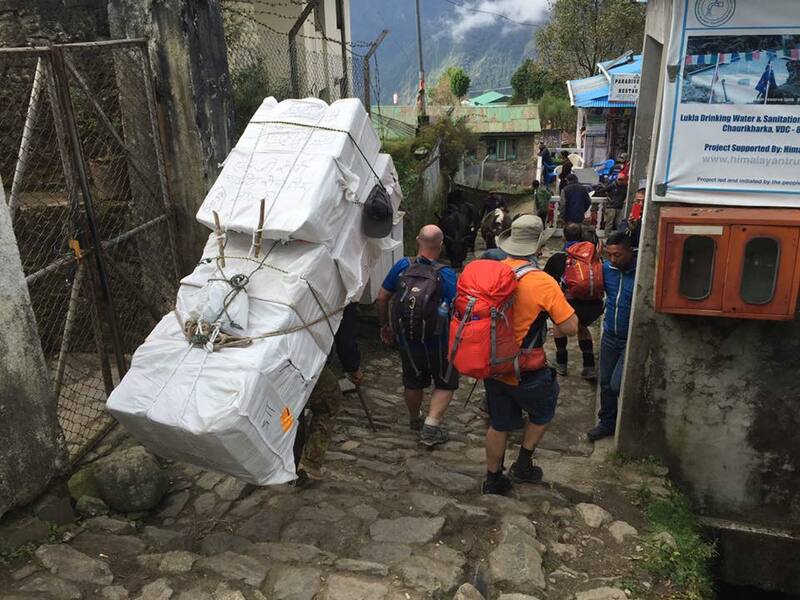 This Sherpa is carrying an immense load, stopping the team from complaining about their rucksacks. Taking in the sights; Mount Everest. Day 1 was very relatively relaxing, but Day 2 is when it gets tougher. 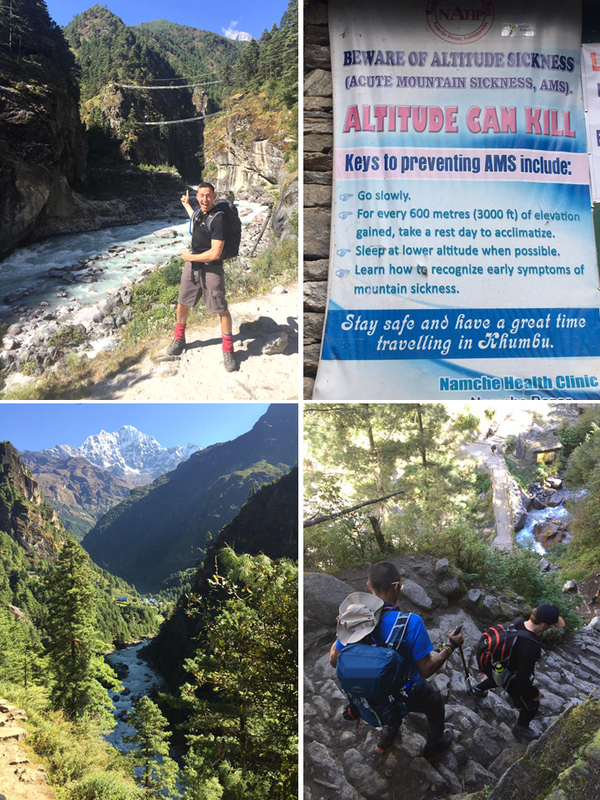 The team walked for seven hours to Namche Bazaar along the Dudh Kosi, known as the ‘Milk River’. They endured uneven paths, forests and steep climbs to reach an altitude of 11,000 ft, but the trek will continue to intensify as the days go on. So far, the only issue the team have encountered is sleep deprivation. Nepal is nearly six hours ahead of the UK so the arduous journey to Lukla, combined with exhausting trekking, is starting to take its toll. The team will soon acclimatise and adjust to the time zone, but the trekking will get harder as the trekking gets easier. Clint explains what Day 2 has in store. Mid-way through Day 2 with Sean and Clint. 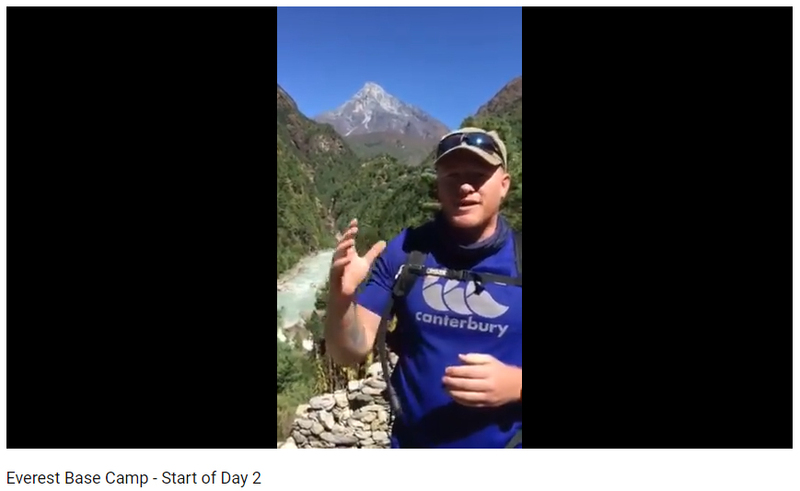 The team recorded a fantastic video as they finished Day 2 to recap what they have seen so far and how their fundraising is going. Watch the video here. How many houses do you think we can build now? Please donate here. The team are moving steadily along their route and being sensibly cautious about the altitude. Day 3 was largely an acclimatisation day. They reached their lodge at 12,000 ft by lunchtime and spent the afternoon climbing up over 13,000 ft to allow their bodies to adjust to the testing and dangerous conditions. The day was five hours of hiking, mostly uphill. They had to frequently stop to allow for yaks and Sherpas to pass. This test is designed to prevent altitude sickness and look for any symptoms. The guides are being particularly careful with the team to ensure their safety. Paul has recorded a short video of the group doing their altitude training, including a press-up competition at over 13,000 ft. This allowed the team to take the opportunity to see some of the local culture and sites. They visited the hospital and school that was funded by Sir Edmund Hillary, monasteries and saw the legendary Yeti skull. Take a look at Sean and Clint’s daily video here. 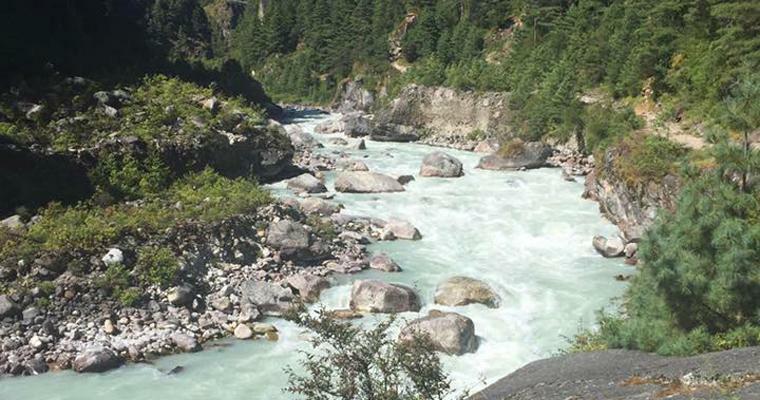 The cold temperatures are starting to reveal themselves as Team Thangpalkot move even higher. They are sleeping in woolly hats and jumpers. Unfortunately, the conditions are only going to get tougher. Another day accomplished. 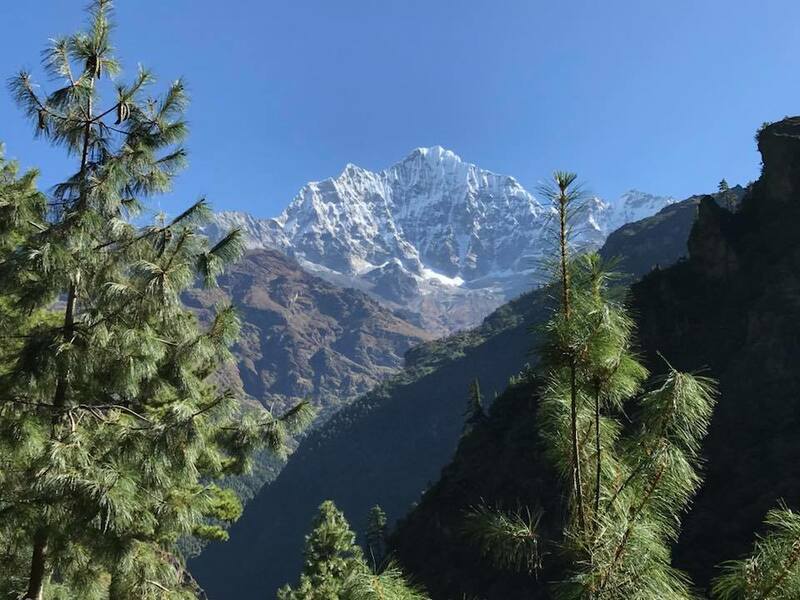 The team are definitely finding it tougher each day, as a result of the cooling temperatures, thinning oxygen and exhaustion from constant trekking. They are capturing stunning views and local delights, including natural water springs directly from the mountain and hot mango juice at the end of the day. Take a look at Sean’s encounter with the natural spring here. Please spare a moment of your time to support the team here so we can build more houses in Thangpalkot1. Each day the challenge is getting colder and tougher. We heard from Sean Newman about how Day 5 was for him. The team were lucky enough to have some internet when they reached their shelter for the night. They were delighted to listen to Rebekah Mattacola and Sarah Thornicroft, wives of trekkers Paul and Dean, on BBC Radio Northampton. Rebekah and Sarah helped to spread the word about the trek and the cause. Watch to the team’s reaction to the radio show here. 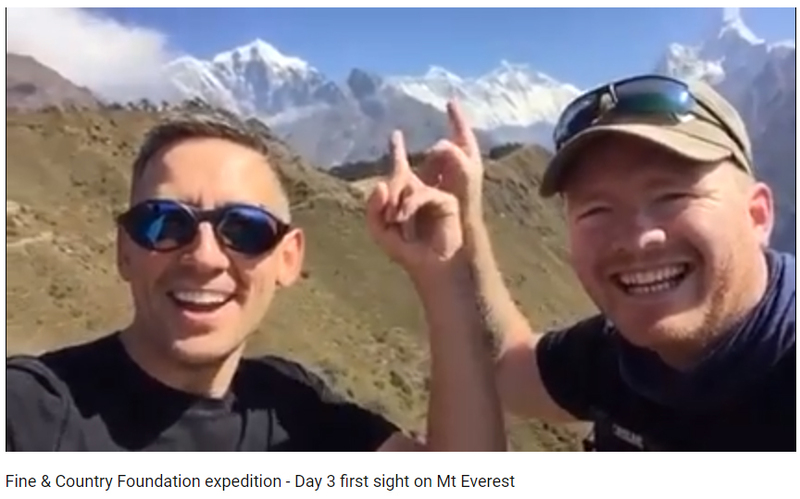 The team have seen many sights; they are now so high that the trees have disappeared and Everest is getting closer and closer. However, the dangers of their adventure are becoming more apparent, as this collapsed suspension bridge demonstrates. Take a look at Sean and Clint's daily update video here. Please help us to build another 17 homes in Nepal by donating here. The team have now climbed up to 5,100m to the summit of Nangkartshang which is approximately 10 times higher than Ben Nevis. 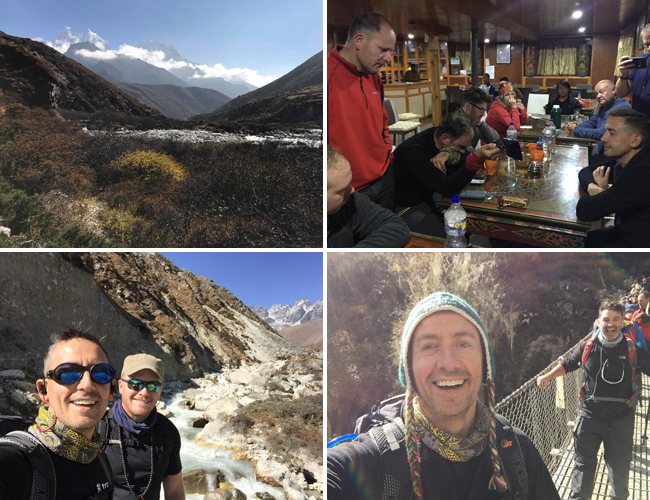 Only one more day of trekking before they reach Everest Base Camp at 5,380m.The pressure and thinning oxygen have started to take their toll on the trekkers as Acute Mountain Sickness (AMS) has started to effect the team. Sean has experienced symptoms including headaches, dizziness, lack of appetite and sickness. 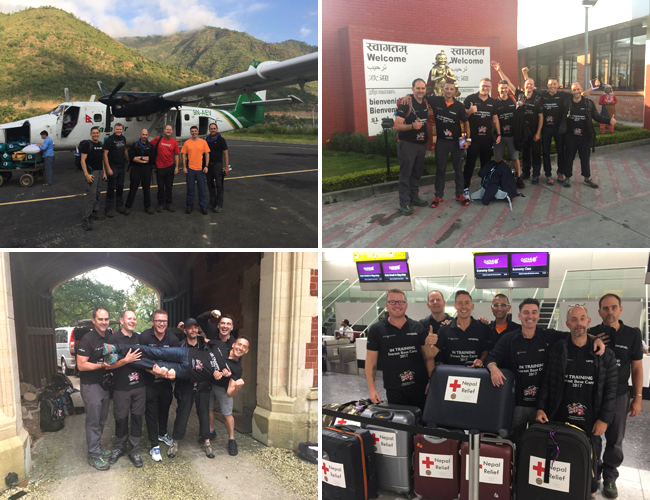 The danger involved in this expedition is not to be taken lightly, which is why the team have undergone four months of training, including altitude tests in the Atlas Mountains and taking every precaution possible. Nevertheless, AMS is unpredictable and can effect anyone. The most common reason trekkers are unable to reach Everest Base Camp is because of AMS. Mark and Pepe are taking Diamox tablets to combat the effects of AMS, but it is only expected to get more unpleasant as they reach Base Camp. We will find out soon how the team are coping and if they are able to continue. Watch Sean and Clint’s daily update here. If you were under the impression that the team are in luxury accommodation, think again. Sean and Clint have a short video to show you a typical night on the trek. The dangers of Everest Base Camp are ever-present. The group have passed through around 250 memorials dedicated to those who lost their lives on their way to or from Everest Base Camp and the summit. Watch their powerful video here. 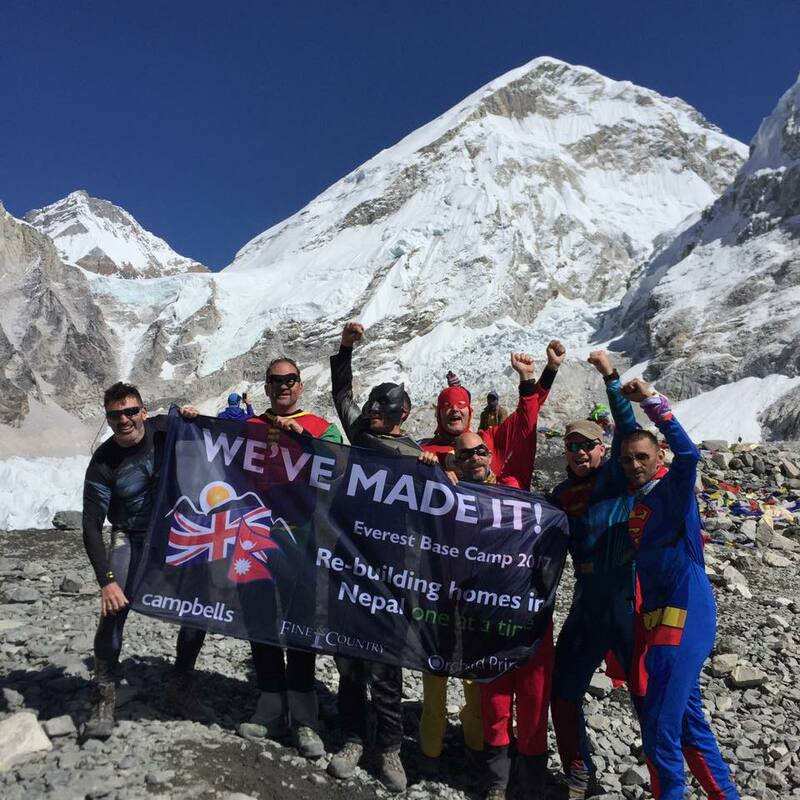 We are delighted to announce that they all reached Everest Base Camp in style. Take a look at the team celebrating their incredible achievement here. In true Fine & Country spirit, Sean, Clint and the team have gone the extra mile to raise awareness to help the village of Thangpalkot1. 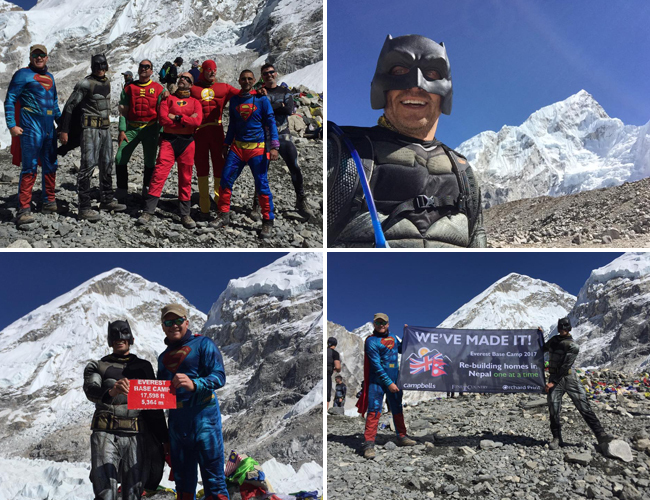 They have dressed as superheroes to keep their spirits high and help them power through the Acute Mountain Sickness. Sean and Clint briefly managed to compose themselves and get their breath back to say thank you for everyone’s support. 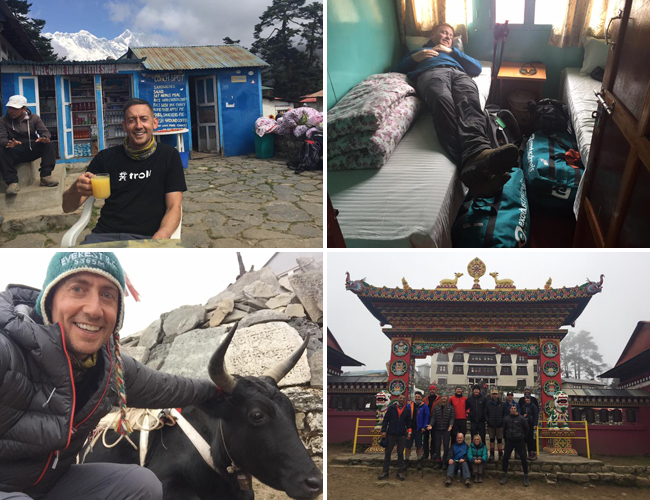 The team deserve a bit of fun now that they have made it to Base Camp and raised over £27,200 so that we can build another 17 homes in Nepal! Donations keep coming, so the team have decided to aim for £32,000 to build 20 houses. Please help us to transform the lives of these villagers. The team have endured Acute Mountain Sickness, aching limbs and freezing nights, but the thought of helping these villagers has helped them to keep going. Please donate here. They got a warning of the real dangers of Base Camp when another trekker had to be airlifted down the mountain. It was a stark reminder of the risky situation they are in. The celebrations soon finished, and the team had to hike back for another three hours before they got the chance to rest. They were only meant to spend 25 minutes at Base Camp, but were there for one hour. This had a huge effect on the team who were physically and mentally drained. Acute Mountain Sickness hit the group particularly hard, with headaches and nausea becoming a big issue. The Sherpa has been very attentive to the group’s needs because an average of four people a year die whilst trekking to Everest. Take a look at their video here. The team are making their way back to Lukla to fly to Kathamandu. They will then spend six hours in a truck going to Thangpalkot1 to visit the village and the families that they are supporting. Thank you to everyone who has supported the team, they were motivated and enthused by all the donations on Just Giving and loving messages that were sent on our Facebook page.